…on a journey through the last 30 or so hours of my life. So yesterday morning I needed to be at the dentist by 8:45am. My dentist is an hour from my house so that means I have to leave by 7:30 – I hate to be late for Dr. appointments especially if I’m the first of the day. If the first appt. of the day is late that f*cks up the rest of the day for all the poor, unsuspecting folk who come in on time for their appointments and have to wait a good hour to see the dr. My point? DON’T BE LATE FOR THE DOC BECAUSE IT SCREWS IT UP FOR THE REST OF US. Anyway…where was I? Ohyeah so Dad gets here at 7:40 and we leave – with me driving. Have I mentioned that I hatehatehate the dentist? Yeah. Even though the car tried to veer in the complete opposite direction a few times on the way, I managed to overcome its sympathy fear and get us there on time (see #53 on my 100 Things List) however, there were already other ppl there for ’emergency’ procedures which meant I had to sit and wait. 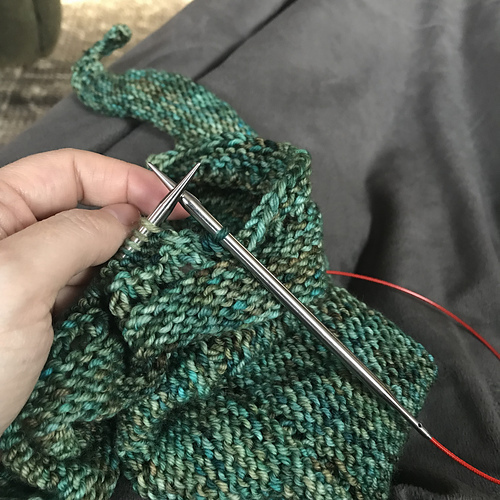 I’m not good with waiting when there are horrible things about to happen to me so I was a little shaky but knitting which helped. They call me in, I get the happy gas & some Novocaine and I’m still freaking the hell out because I’m about to have three teeth pulled. THREE. So I’m a bit out of it but I hear the dentist telling his assistant that he is going to work on all my other teeth first and THEN pull the three. YESSSS a reprieve of a few hours. You can drill my teeth like mad once I’m all numbed up but mention pulling and I freak the hell out. I had the worst experience of my life (and this is including NINETEEN HOURS OF LABOR) when I had my first tooth pulled at 15. There was shattering & bone fusion and I’m not going to get any more specific than that. *shudder* So he prepares all my other teeth for caps and then….dum dum dum….its time. He says its time. I start sobbing like a knitter who was just told they can no longer buy yarn. Seriously sobbing. Uncontrollably sobbing. And what do they do? All work on me stops. He grabs a kleenex for my right eye and his assistant grabs a kleenex for my left. I get hugs, I get my tears dried and he walks me through what he is going to do and tells me this is cake because they are all baby teeth that are ready to come out anyway. This man is incredible and this is why I go to him. So long story short I finally get done about 12:30 and am so emotional I can’t stop crying. In the waiting room. I remember getting shooed out of there and I don’t blame them one bit. I was probably scaring the hell out of everyone that could see me. Dad brings me home and I konk out for the afternoon. I wake up with throbbing pain, take three advil and magically there is the BF home from work to take care of me – which he does. Fast forward to this morning. My daughter’s 3rd question of the day (right after – how are you feeling? and – can you put me online, mom?) is ‘so, are you going to bring me and Elaina to the mall tonight?’ ARE YOU KIDDING ME?!?!? Oh to be fifteen and so wrapped up in yourself that you think getting three teeth ripped out of your head is no biggie and you can go to the mall the next day. I think that’s it for now, I think I’ve probably already shared too much and sorry if I have…I’m going to take the rest of the bottle of Advil now and glare at my daughter (who has all her adult teeth, thank God).